Today we’d like to introduce you to Dwight Gingrich. Thanks for sharing your story with us Dwight. So, let’s start at the beginning and we can move on from there. I never dreamed I’d teach piano someday, but now it’s my favorite job! 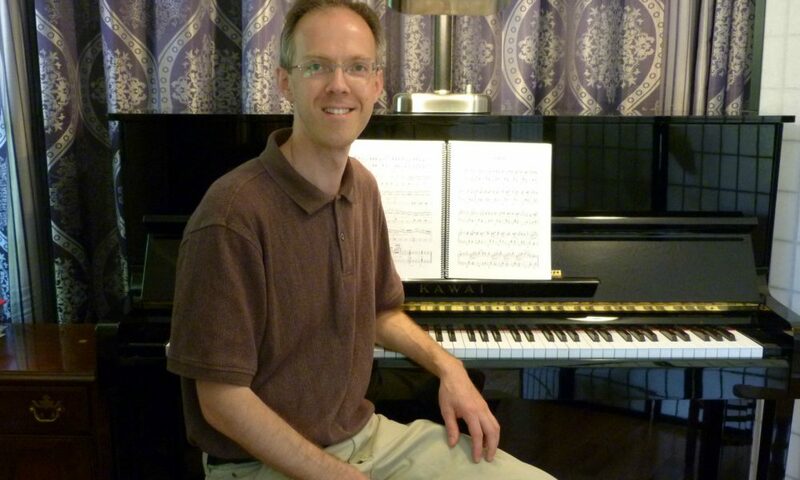 I first started teaching piano in 2006, in New York. My wife and I moved from the Bronx, where I had been teaching high school, to Queens, to be closer to our church. As we made this move, we decided it was time for another move–a leap of faith for me to become self-employed as a piano teacher. I had been playing piano since I was about 14. I had been singing and making music for much longer than that. (Here I could give much credit to parents, grandparents, siblings, and elementary teachers.) I had also earned a Bachelor of English and a Bachelor of Education. So, I had musical experience and I also had training as a teacher. But I had no training as a music teacher! So that year as we moved to Queens, I did a lot of reading, both about teaching music and also about running a music business. I said I had no training as a music teacher. But I did have something else very valuable. During four years of college, I boarded with my piano teacher and her family. I received excellent musical training from Lynda Kennedy, who was a truly exceptional teacher. I also witnessed the grace and professionalism with which she ran her studio. Indeed, the whole Kennedy family was exceptionally musical, and Lynda’s husband was a dedicated high school music teacher and a frequent performer himself. Watching their lives as music educators gave me confidence to enter the same field. In my first months of teaching in Queens, I did a lot of advertising–in corner stores, online, and in magazines. It took a lot of legwork (literally! ), but after several years and about 10,000 business cards, I had a full roster of about 35 students coming to my home piano studio each week. Piano teaching became our family’s main source of income for about 4 years. As I taught, I grew in confidence. I enjoyed discovering each student’s personality. Most of my students were musical beginners. They ranged in age from about 5 to 65. Some had exceptional natural musical ability. Some had learning difficulties. Most will never become concert pianists. But nearly all discovered joy in their own ability to create music. And I found joy in each of their new musical achievements. Once or twice a year we held a recital, where each student was invited to perform. I always shared several pieces as well, ranging from Bach to Schumann to jazz. In the fall of 2010 we moved to Iowa because of health needs in my wife’s family. We moved from a busy multicultural Queens block to a long gravel road in rural Iowa. I taught a trickle of students there because I enjoyed it, and because I didn’t want to lose my teaching touch. But full-time teaching was simply not an option. Then in 2015 we began plans to move to Atlanta. Immediately I dreamed of ramping up piano teaching again! That fall, when we started looking for a house in the 30314 Zip Code, our first realtor warned us that piano teaching would probably not work in this neighborhood. I wasn’t so skeptical. I knew it had worked in a lower-income neighborhood in Queens. I believed that if I spread the word enough, served each student well, and kept my rates reasonable, a piano studio in West Lake could work just fine. In the spring of 2016, we found a 1950’s brick house in West Lake. It was a house well-suited for piano teaching! (How we bought the house is another amazing story, with church friends near and far pitching in with microloans and gifts to make the purchase possible. We call this “the house that God bought.”) Our new home had an unfinished side room with a front window we could replace with a door. Shortly after our purchase, I began spreading the word about my piano teaching plans on Nextdoor.com. Then I hired a friend (Steve Smucker) to finish the room and add a new front deck. By mid-September, when I was ready to open, my first student was ready to begin! Now, seven months after opening in Atlanta, I have eleven paying students coming to my studio each week–seven children and four adults. If I continue recruiting new students at an average rate of one per month, I may soon again reach my dream of supporting our family primarily by teaching piano! Piano teaching has been a joyful road compared to most other jobs I’ve known! Challenges? Besides the challenge of finding new students, most have been minor (would that be an accidental pun?). In past locations, I’ve had to juggle professional and family space, so it’s a joy to now have studio space devoted to teaching. Knowing how best to help students–or which potential students I will truly be able to help–can be a challenge. I once taught a student who read music much more quickly than I do. But she needed help with confidence and musical expression, so I could still help her. Other potential students have been too advanced, or brought expectations that I felt I couldn’t fulfill. It isn’t always easy to tell a potential student that I don’t feel we’re a good fit, but I’m committed to do my best to actually help students, not just collect their tuition. There are also business challenges I’ve considered, but not yet attempted. For instance, perhaps I could partner with a neighborhood school to teach piano during school hours to their students? Gingrich Piano Studio – what should we know? What do you guys do best? What sets you apart from the competition? I also find special satisfaction in offering my piano teaching services in urban areas that are lower-income, where few teachers decide to build a business. People everywhere love music, and music deserts, just like food deserts, leave a hole in a community. So, where others see a lack of demand, I see a lack of supply! I can’t charge as much here as I could in downtown Atlanta. But then, I couldn’t afford a house there, either. And maybe, just maybe, I’ll be blessed to start some future piano great down a musical road that they might have missed had I not landed in their neighborhood. For me, success in piano teaching is when I can (a) take the skills and loves God has entrusted to me, (b) share them with others in ways that develop their own skills and loves, and (c) do it all in a way that also supports and blesses my family. Daytime and multiple student discounts available. Thanks, Ilva! I’d love to teach you if you only lived closer. And, while we’re talking music, thanks again for introducing our family to the children’s opera Amahl and the Night Visitors, and for recording a lovely set of songs with your husband, to which our children have often fell asleep at night.